My talented Canadian nephew, Joey, sent me this copy of his artwork with my birthday card last year. 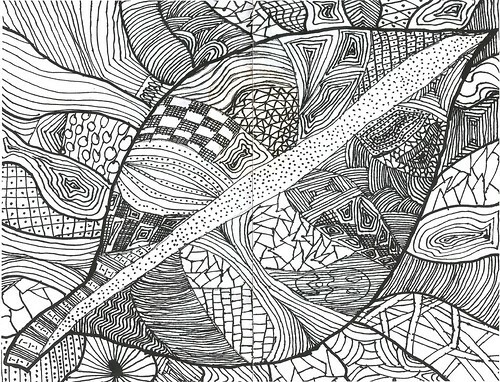 As you know, I have a weakness for black and white drawings, and for pattern, so his work caught my imagination ... ... and I decided to do one too, and send it back to Joey. I've been enjoying colouring in a lot later, so it felt like quite a natural step to 'colour with pattern' instead. And I've discovered lots of patterns in the process! I tried not to be lazy and copy all Joey's patterns, so (using the leaves from a Japanese Maple) I started out aiming for more curvy, circular patterns, where Joey's are more angular. But I couldn't resist looking to his artwork for ideas. Perhaps we all have an existing bank of patterns, and it was interesting to look out of my own mind and push the boundaries of my own pattern-making! I also discovered the new fashion of Zentangling, thanks to my mum. 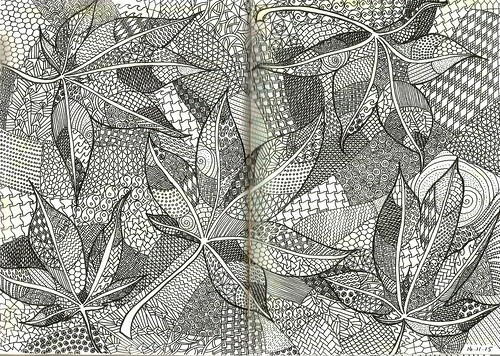 I've been a bit snooty about the idea of 'organised fun' around pattern drawing - and perhaps I still am, but through both Joey and Zentangling, I came to appreciate the art of developing more complex patterns than mere zigzag lines or rows of circles.